Here are the best day trips from Las Vegas that you can complete in less than day, and come back in time for your evening show! If you are still unsure where to go from Las Vegas, explore the many national parks, famous landmarks and other destinations located around the city. Tours and day trips abound in Vegas - just decide where YOU want to go! I'll be your own Las Vegas tour guide and will show you where to go and what to see - the most scenic tours from Vegas to other popular destinations. Best places to go in Las Vegas are the Grand Canyon and Skywalk, Hoover Dam, Hollywood, Disneyland, Red Rock Canyon, Death Valley, Valley Of Fire, Bryce Canyon and Zion National Park, and of course the famous Gold Mine! The Grand Canyon definitely tops the list of the most popular places to go in Las Vegas! You can take Grand Canyon day trips from Las Vegas to the South Rim, North Rim, Grand Canyon West, and tours that combine a visit to the Grand Canyon with Hoover Dam. Grand Canyon is one of the most amazing parks in the world! There are plenty of ways to get to the Grand Canyon from Las Vegas - by helicopter, by train, by bus, by jeep and even by airplane. Tour prices vary from $100 for a simple bus trip to a bit over $500 for a tour that includes helicopter, boat and Skywalk. You can combine day trips from Las Vegas to the Grand Canyon with a visit to Skywalk. 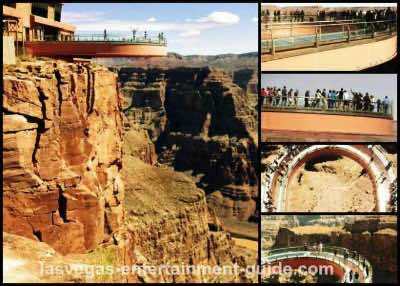 Skywalk is an observation bridge with a glass floor, built at the edge of a canyon on the territory of Grand Canyon West, owned by Hualapai Indians. It offers a 360 unobstructed, awe-inspiring view of the Grand Canyon. Skywalk became a popular tourist destination on its own right. You can find your perfect Las Vegas trip to Grand Canyon Skywalk among the multitude of tours offered. Aficionados of mighty structures will appreciate the engineering marvel that is the Hoover Dam! One of the most popular places to go in Las Vegas, Hoover Dam is located in the Boulder city, only about 25 miles (40 km) from Vegas, and is easy to reach. 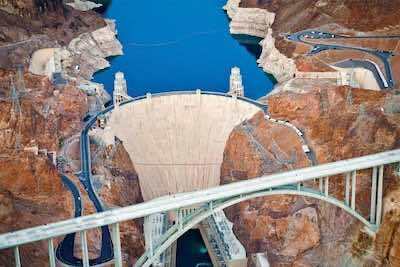 During Hoover Dam day trips from Las Vegas you can not only learn about the sad history that accompanied its construction - there are plenty of things to do at Hoover Dam. For example, sunbathing, water skiing or cruising the Lake Mead that the dam impounds. Day trips from Las Vegas to Hollywood are quite popular as well. You can take a Hollywood Freedom tour with bus transportation included (same day return to Vegas). Or get a luxury transfer to Los Angeles from Vegas, and enjoy a day or two on your own and stay at a hotel in LA, and then come back to Vegas. Here are some ideas on things to do in Hollywood on your tour! 1) Take the hop on hop off bus tour of Hollywood with around 50 stops. 2) Visit the world-famous Universal Studios to see how movies are produced. You can either opt in for a Skip the Line Admission and enjoy it on your own, or take a VIP Experience tour that will make you feel like a star and show you the best special effects and the most interesting locations of the Studios. Universal Studios is also one of hop on hop off bus stops, so you can combine the two. 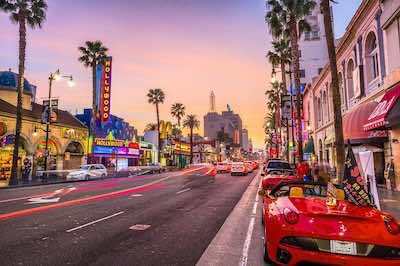 You can also take a walking tour or a movie locations tour of Hollywood, or find other fun tours in Los Angeles before coming back to Las Vegas on your luxury transfer bus. Rock Canyon day trips from Las Vegas are extremely popular! Activities at the Red Rock Canyon include hiking, biking, tours by bus, exotic cars and even three-wheel scooters! Red Rock Canyon is a gorgeous park located only about 30 minutes from Las Vegas, and it's one of those hidden gems locals are proud of! It's a small gem and is perfect to escape to from the buzzing city. They come here to hike, camp, bike, ride horses and rock climb. If you don't want to do all that, you can just drive and take a tour around the Scenic Loop that shows the best of the canyon. 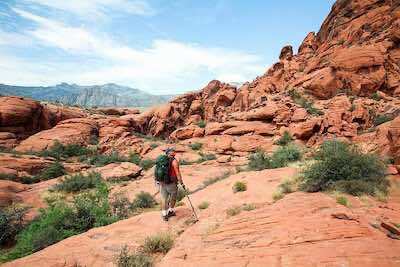 Located only a short drive from the Sin City, Red Rock Canyon is among easily accessible places to go in Las Vegas. It's famous for unique geological rock formations that have a bright red color. You can also find here rock paintings left by the ancient Indians, unique Joshua trees that are so big they will blow you away, and of course, animals. The Red Rock Canyon has interesting and rich history. Red Rock Canyon is also home to 2 ranches that offer attractions of their own and are worth a visit - Bonnie Springs and Spring Mountain State Park that you can also visit during Las Vegas day trips. 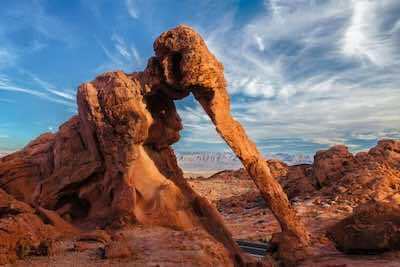 During Valley of Fire day trips from Las Vegas you will get a feeling that you are visiting another planet - Mars, perhaps. The rock formations have very unusual shapes - they look like sculptures in a museum under an open sky. The most famous statue is the Elephant Rock. In bright sun, when sun rays are reflected from the surface of the rocks, they appear to be on fire. The valley's unusual beauty made is one of the poplar destinations for outdoor weddings or even helicopter weddings, as well as one of the most fun places to go in Las Vegas! But if you are not ready for the big step yet (ha-ha), you can find excellent ATV and dune buggy tours. Riding a Mini Baja Buggy is actually safe for kids 3 years and older, and it's hard to think of a better way to spend a day out than taking one of the best Las Vegas day trips you can imagine! Day trips from Las Vegas to Death Valley are a great idea if you think you might enjoy the lowest, the driest and the hottest place in the United States! 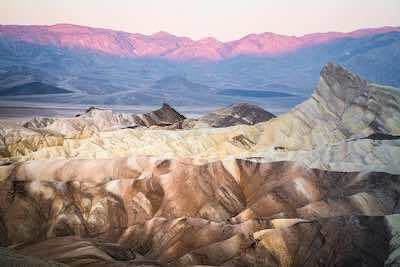 Death Valley boasts some of the most gorgeous landscapes and truly is a photographers' and movie-makers' paradise. Death Valley is one of the most fascinating, albeit the hottest park located within about 2,5 hours drive from Las Vegas. Death Valley is comprised of several unique places that you won't see anywhere else in the world. For example, there is a region called Badwater Basin - the lowest point in the Northern Hemisphere. It's bottom is covered with hexagonal salt formations. Other points of interest in Death Valley are Ubehebe Crater formed during a volcano eruption, Devil's Golf Course with salt formations completely different from those in Badwater Basin, Racetrack Playa with stones that move all by themselves. If you decide to go on a day trip from Las Vegas to Death Valley, don't miss the opportunity to visit the ghost town of Rhyolite and it's Goldwell Open Air Museum. Lake Mead is another great place for day trips from Las Vegas - probably because the city is located in the middle of a desert! There are plenty of things to do on Lake Mead year round - you could rent canoe, kayak, jet ski or a houseboat. You can combine Lake Mead tour from Las Vegas with a boat cruise with a delicious dinner and make it a perfect romantic evening! 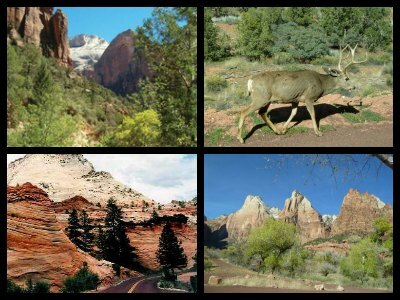 Zion National Park day trips from Las Vegas are perfect if you want to escape all the hustle and bustle of Vegas - it's an incredibly beautiful gem located in Utah. Zion is famous for interesting rocks created by the Virgin River. 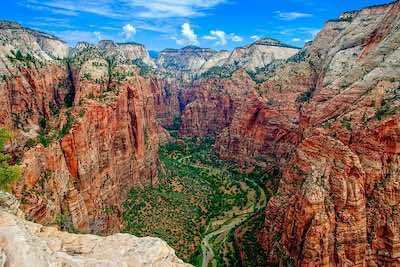 Among points of interest in Zion are: Canyon Overlook Trail, Observation Point from where you can see the stunning Angel's Landing, hiking down The Narrows trails, and for the most experienced with permission - The Subway hiking trail that looks like a tunnel. Bryce Canyon is one of the most photographed parks in the world! Since they are all located pretty close, you can combine Bryce Canyon day trips from Las Vegas with a visit to Zion National Park and to the Monument Valley (described below). Bryce Canyon is famous for very special rock formations called "Hoodoos" which look like tall, thin pyramids. Paiute Indians believed that these Hoodoos are actually people turned into stone for bad deeds. The flora at Bryce Canyon is also very unique and consists mostly of fir trees that look incredible in winter, all covered in snow. If you hike down Bryce Canyon - you will be amazed by it's beauty! Other activities you can include into Las Vegas day trips to Bryce canyon are snow shoeing in winter and horseback riding in summer. Thanks to very light pollution, at night in Bryce Canyon you can see stars without having to look up in the sky - the Bryce Canyon claims to have one of the brightest skies in the world! Historians will be enchanted to see another side of Vegas on this captivating day trip from Las Vegas. Visit the Ghost Town Café, the Museum and the Time Capsule amongst others. The walking tour takes you to the town of Goodsprings, a decadent venue of Saloons, bars, brothels and a steamy past. See the old buildings dating back to 1903, made from pressed tin and visit the bar where Clark Gable sat waiting for the heart breaking news on his lover Carol Lombard, who was killed in a plane crash. Read one hundred year old newspapers and listen to stories from your local guide. This tour is ideal for the whole family, with meals and refreshments included. Watching the lights in Las Vegas takes on a different meaning with this exciting day trip from Las Vegas! The lights are the real stars and not the flashing neon signs. The tour heads out into the country from the Strip to the town of Goodsprings, an historic setting filled with nostalgic venues. Enjoy a great all-American meal at the Pioneer Saloon and then head into the desert to see a magnificent display of the Milky Way. Your guide is an astronomer and will give you a thrilling lesson. 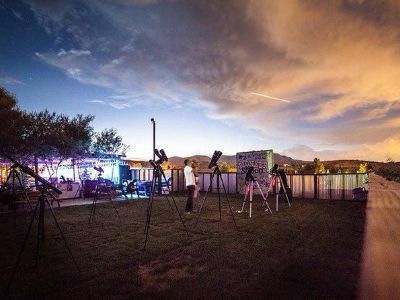 See planets, galaxies and stars while looking through cutting-edge telescopes and learn about the modern day star gazing instruments. When you want a break from the casinos and want to take a day trip from Las Vegas that includes stunning scenery, then the Bryce Canyon and Zion National Parks Small Group Tour from Las Vegas is a superb choice. Your 15-hour adventure begins with complimentary hotel pick-up service when you board a luxury SUV or mini-coach and meet your expert guide. As you travel your guide will tell you intriguing stories of the natural environment that you are going to experience. Your first stop is at Bryce Canyon National Park where you will view some of nature’s finest landscape with limestone carved into numerous shapes called hoodoos and you can wander through a slot canyon or too. Continuing on your journey, you will indulge in a free box lunch as you travel to Zion National Park. Once inside Zion National Park you will be amazed at the granite and sandstone walls that were formed by the Virgin River carving its way through the area. You can visit the Emerald Pools, check out a portion of the Narrows Trail and the Kolob Arch is the largest natural arch in the world. Your journey to southwest Utah concludes with drop-off service back at your selected hotel in Las Vegas. One of the more intriguing day trips from Las Vegas that has you exploring for aliens is the Area 51 Day Tour from Las Vegas. Your 10-hour adventure is a great thing to do in Las Vegas for anyone interested in life beyond our planet and begins with complimentary hotel pick-up service. Once on board a comfortable 4x4 luxury SUV you head out to McCarran International Airport to view the suspicious Janet Airlines that transport workers to Area 51 on a daily basis. From here your guide will fill you in on all the conspiracy theories of aliens as you travel through the Mojave Desert viewing Joshua Tree National Forest until you reach an ancient dry lake bed. Here you will see incredible 6-foot tall Indian petroglyphs that mimic alien forms and view the ancient lake where many individuals have reported seeing UFOs in person. 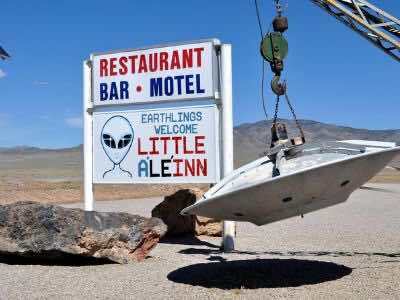 As you continue to travel the Extraterrestrial Highway you will stop for a free lunch at the iconic Little A’le’ Inn which was featured in the movie Independence Day. Moving onward to Area 51, you will spot numerous cameras and listening devices amongst the cacti when you finally see the warning sign that reads “Top Secret Military Facility, Keep Out, Use of Deadly Force Authorized. Your day chasing aliens concludes with drop-off service back at your Las Vegas hotel. 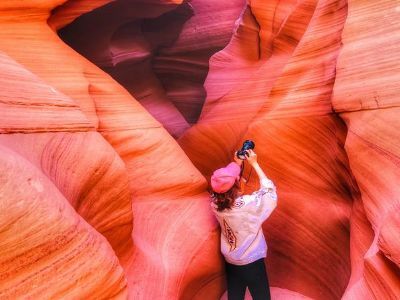 A great day trip from Las Vegas that includes plenty of natural scenery, hiking and lots of photograph opportunities is the Antelope Canyon, Horseshoe Bend Day Tour from Las Vegas. This 13-hour journey starts with free hotel pick-up service where you will board a comfortable motor coach and meet your expert guide who will explain all the interesting things you are about to witness. 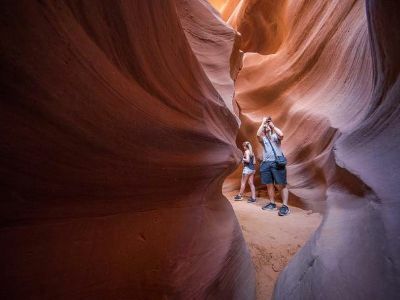 Once at Antelope Canyon you will meet with a Navajo guide who will take you through a labyrinth of slot canyons that feature perfectly carved sandstone walls that are a brilliant orange, purple, red and pink in color. Also within the canyon you will witness numerous ancient petroglyphs that explain the ancient Indian cultures that once occupied the area. From here you will take a drive to Page, Arizona where you will stop for a complimentary lunch and a view of Lake Powell. After eating you continue your journey to Horseshoe Bend where you can stand atop a 1,000-foot cliff and look down at the raging Colorado River. There is also an opportunity to take a 1.5-mile nature loop hike that is perfect for taking photographs of this famed area. An add-on option for this excursion is to substitute a 12-minute helicopter ride over Horseshoe Bend instead of hiking the nature trail (additional charge). Your perfect Las Vegas activity concludes with drop-off service back at your hotel in sin City. 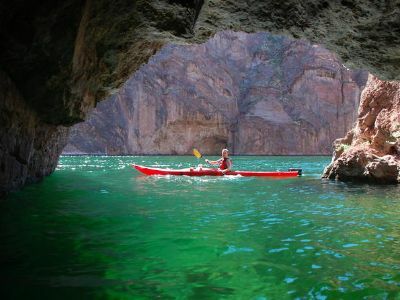 One of the more memorable day trips from Las Vegas that visitors can try that includes some exercise and plenty of interesting scenery is a Kayaking Day Trip on the Colorado River. Your 9-hour paddling excursion begins with complimentary hotel pick-up service where you will be transported to Willow Beach on the lower Colorado River. Once at Willow Beach you will be outfitted with a kayak and safety gear while you listen to short training session about kayaking on the Colorado River. When you are paddling you will witness stunning scenery that is highlighted by the beauty of the river and wildlife of the area. You will pass by sights such as the Fish Hatchery where you will take a short nature hike to the Gauger’s house. 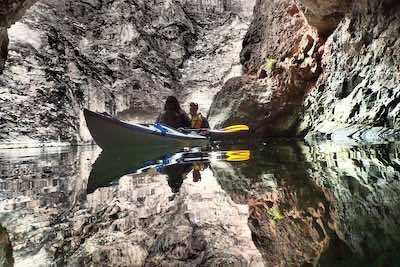 As you continue to paddle the walls of the Black Canyon come to life with brilliant colors and rock formations for you to see. When you reach Emerald Cave you will travel inside for an interesting experience and more photograph opportunities before you relax on a sandy beach where you can indulge in a free lunch as well as a cool dip into the Colorado River. After paddling back to Willow Beach your tour concludes with drop-off service at your Las Vegas hotel. Nature lovers will be thrilled when they try the Antelope Canyon and Horseshoe Bend Day Tour from Las Vegas that is loaded with stunning scenery, history and plenty of amenities. Your 14-hour day trip from Las Vegas begins with free hotel pick-up service where you will travel in a small group that is led by an expert Navajo guide. As you drive through the desert scenery you will indulge in a complimentary continental breakfast while you pass through Kanab, Utah and the Virgin River Gorge. Guests can stay occupied while traveling to antelope Canyon with free onboard Wi-Fi and listen to fascinating stories told by your guide. Once at the canyon you will be amazed at the sandstone shades of colors that range from purple to pink to orange to red as you follow your Navajo guide through the canyon. After a short drive to Page, Arizona you will be treated to a free lunch before heading out to Horseshoe Bend. Here you can take a 1.5-mile round-trip hike along the rim and stare down a 1,000-foot sheer cliff while taking photographs of the Colorado River. Your last stop will be at an overlook where you will see Lake Powell and Glen Canyon Dam before you travel back to Las Vegas. Your excellent Las Vegas activity concludes with drop-off service back at your selected hotel. Mining history and beautiful scenery is what you will experience on when you take a day trip from Las Vegas on the Eldorado Canyon Mine Tour. This 4.5-hour adventure starts with complimentary hotel pick-up service where you will meet your expert mining guide and board a comfortable coach. As you travel you will pass by Boulder City and stop at Hoover Dam where you will have plenty of time to take photographs while admiring this piece of engineering marvel. From here you will continue your journey to Eldorado Canyon where you will explore the Techatticup Mine. Once there you can visit the general store and learn about the history of the gold mining days from a local expert before you head to the mine. At the mine you will feel the experience of mining in the old days as you walk through the mine for about 1-hour learning more about mining equipment as well as the miners themselves. On your way back to Las Vegas your next stop will be at the Nelson Overlook where you can take stunning photographs of Eldorado Canyon and the famous Colorado River. Your excursion concludes with drop-off service back at your hotel in Las Vegas. 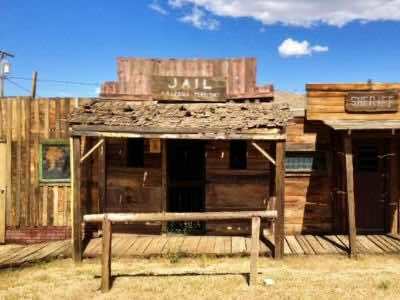 When you want to experience the raucous days of the Old Wild West and see some incredible scenery along the way, then an ideal day trip from Las Vegas to try is the Arizona Ghost Towns and Wild West Day Trip from Las Vegas. The 9-hour journey begins with complimentary hotel pick-up service where you will board a comfortable motor coach. Your first stop is at the Hoover Dam where you can take photographs of Lake Mead, the Black Canyon and the mighty Colorado River. From here you will head to the small mining town of Chloride which has survived since 1860 and now is a ghost town with 250 residents. 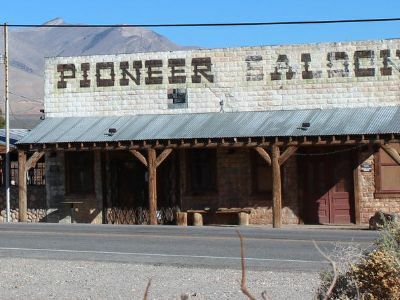 Here you will also enjoy a free lunch before traveling along famous Route 66 to your next ghost town named Oatman which is haunted by a dead Irish miner named William Ray Flour. While you walk the streets you can take photographs with wild burros, bandits and modern day cowboys as well as experience an authentic Wild West shootout. After a drink in the saloon (added expense) you will travel along the Veterans Memorial Highway while you admire the Mojave Desert. Your last stop is at El Dorado which is a former gold mining town that has been used as the backdrop for numerous movies over the years. 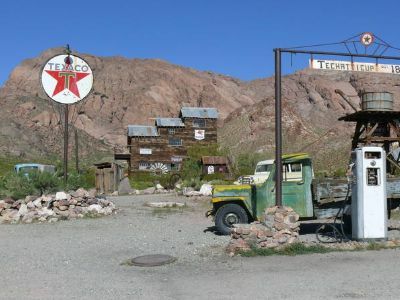 After a quick look at the Techatticup Mine you will head back to Las Vegas where your excursion will conclude with drop-off service at your hotel. 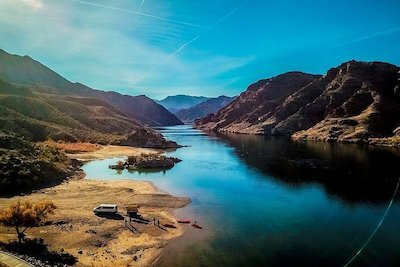 Trying the Black Canyon and Colorado River by Motorized Raft from Las Vegas is one of the best day trips from Las Vegas for families, couples and groups that want a day of relaxing while viewing superb scenery. Your 6-hour water journey begins with complimentary hotel pick-up service where you will be driven to the base of Hoover Dam. After you board a specialized motorized raft you start your adventure down the mighty Colorado River on the Black Canyon National Water Trail. 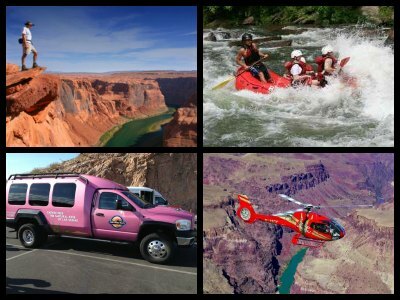 During your 3-hours on the river where you will experience brilliant sightseeing opportunities of the Hoover Dam, the Pat Tillman/Mike O’Callaghan Memorial Bridge and the sheer cliff walls of the Black Canyon. As you float for 12-miles you will be pleased with other scenery too like waterfalls and the wildlife viewing is great. You will be treated to a free lunch while you relax on a beach area next to the Colorado River where you will have time to take a dip if you want to cool off. This Las Vegas activity concludes when you arrive at Willow Beach Marina and are transported back to your specific hotel. One of the most adventurous day trips from Las Vegas is for someone to go to Hidden Valley National Monument and try the exhilarating motorized outdoor activities. 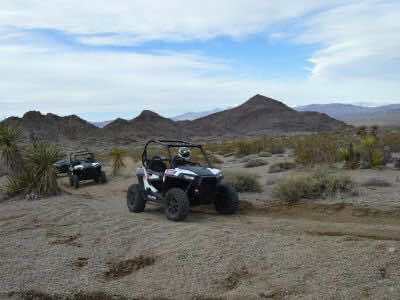 Located just 30-minutes outside of Las Vegas, Hidden Valley National Monument is the ideal place to go off-road riding. There are a number of excursions that will have you maneuvering over the landscape while you take in the gorgeous scenery of the Mojave Desert and the McCullough Mountain Range that surrounds the monument. Off-road tours feature a variety of vehicles from customized dune buggies that are perfect for families to super charged ATVs that pack a punch when you hit the gas to BMX style motorcycles that have you flying in the air over the obstacles. Tours range from four to six hours and most include complimentary hotel pick-up and drop-off service.